At Vacation Bible School (VBS) here at MLLC our students collected individually wrapped bars of soap to give to Lutheran World Relief (LWR). 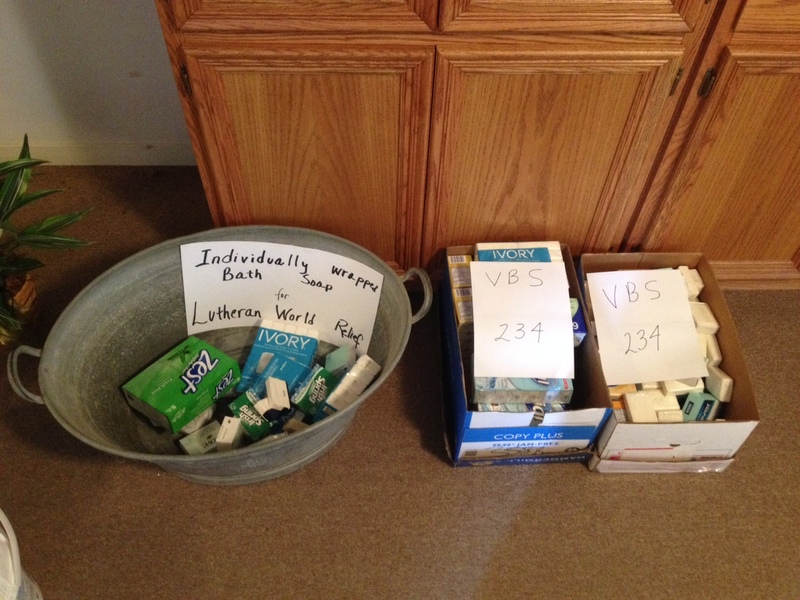 During the week at VBS (July 21-25) there were 246 bars of soap collected. Note that this is a revised total from what you see in the photo above. The VBS students and staff have put a challenge out to the congregation. They want to see if the people of MLLC can gather together at least 246 bars of soap for LWR by Sunday, August 10. Quite a bit has come in already. Together in ministry we would be very happy if the congregation could match this challenge. Between now and this Sunday, August 10, you still have time to look around your home or to go shopping to get some individually wrapped bar soap to meet this challenge. When you come to worship on Saturday (6 p.m.) or Sunday (9 a.m.) you can drop your soap by at the church in the Narthex. After this date we will still collect individually wrapped bar soap. These can be individual or multi-pacs. In early April 2015 we will bring these to the Brenham area LWR collection site and send these off for LWR to use to help people around the world. 1. Pray for this charitable work for our neighbors and for the ongoing ministry of LWR. 2. Give money to help cover the cost of shipping such items. 3. Bring individually wrapped bar soap (single or multi-pacs) to MLLC. 4. Give thanks for our ministry together.